In Stock. Sold by GRIA Lifestyle and Fulfilled by Amazon. Gift-wrap available. 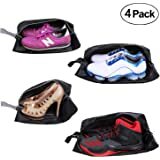 Amazon's Choice for "toiletry bags for women"
1. 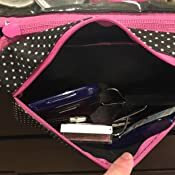 PERFECT TOILETRY TRAVEL BAG FOR WOMEN: Travel-friendly train case with multiple zippered, clear pockets: easy to see and to take. 2. 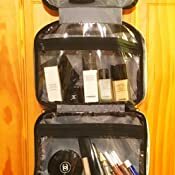 REAL LARGE SIZE HANGING TRAVEL MAKEUP BAG: 12" x 9" x 4" WITH PRACTICAL DESIGN. You can easily fit standard size toiletry bottles into it. 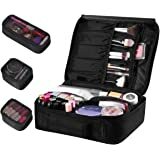 This nice looking and very practical makeup bag comes with: comfortable top carry handles, one front big size zippered pocket, top zip closure, three large transparent zippered compartments, and one, practical, detachable pouch and steady metal hanger. 3. 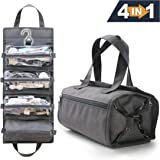 VERSATILE AND MULTIFUNCTION TRAVEL COSMETIC ORGANIZER: Large outside pocket holds a lot of additional items for easy access when the bag is closed. Three transparent interior compartments and a detachable zippered pouch for smaller items. The unfolded toiletry bag can be hung from a variety of fixtures. (Please, do not overweight it). 4. 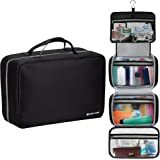 WELL MADE AND DURABLE: This exceptional toiletry travel bag is made of sturdy, high quality polyester, waterproof nylon lining, elastic PVC and tough zipper. It will match all your expectations. 5. 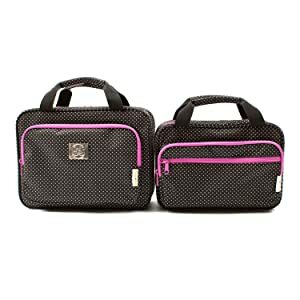 TRAVEL MADE EASY: Toiletry and cosmetic bags from Bag&Carry are must have for all active travelers and an ideal gift for your family and friends. They are a great and classy way to store your toiletries and other belongings. Sold by GRIA Lifestyle and ships from Amazon Fulfillment. Sold by YaMiu and ships from Amazon Fulfillment. TRAVEL COSMETIC BAGS FROM BAG&CARRY - A MUST HAVE GEAR FOR ACTIVE TRAVELERS! Keep all your cosmetics, makeup, grooming, toiletries and travel accessories very well organized! 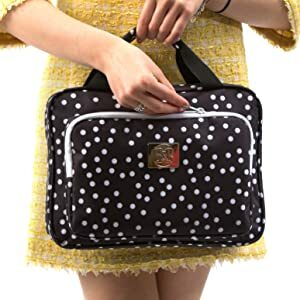 In the product range of Bag&Carry Travel Cosmetic Bags, you can find all necessary bags and cases to arrange your trip comfortable and organized. made in cute polka-dot style. MEDIUM: 11" x 7.5" x 3.5"
LARGE: 12" x 9" x 4"
Both are exactly the same inner design and differ only the sizes. 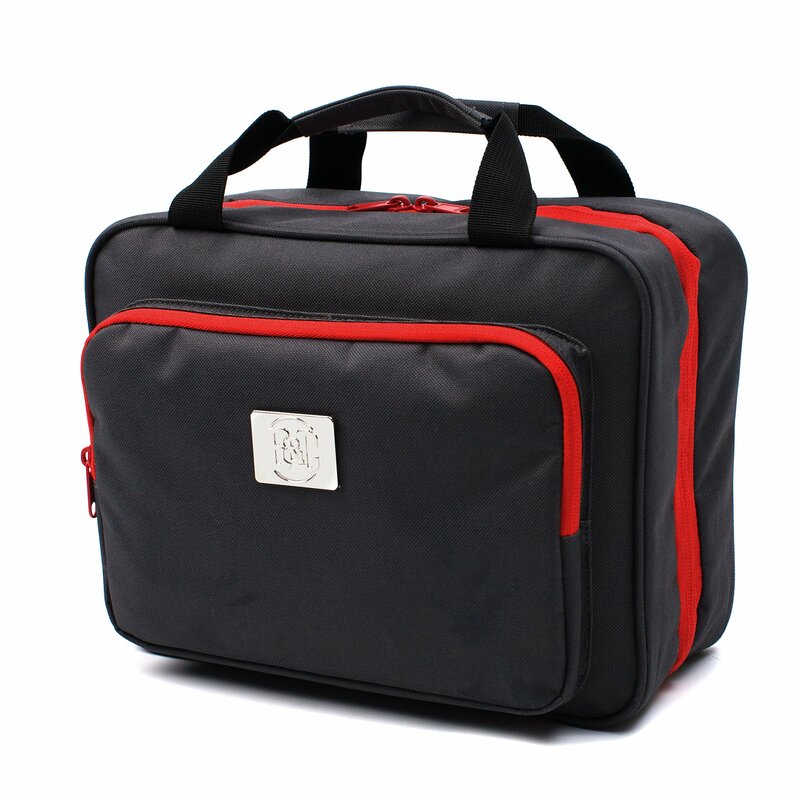 MEDIUM size bag is pretty good for average travel needs and many our customers are very happy with it. 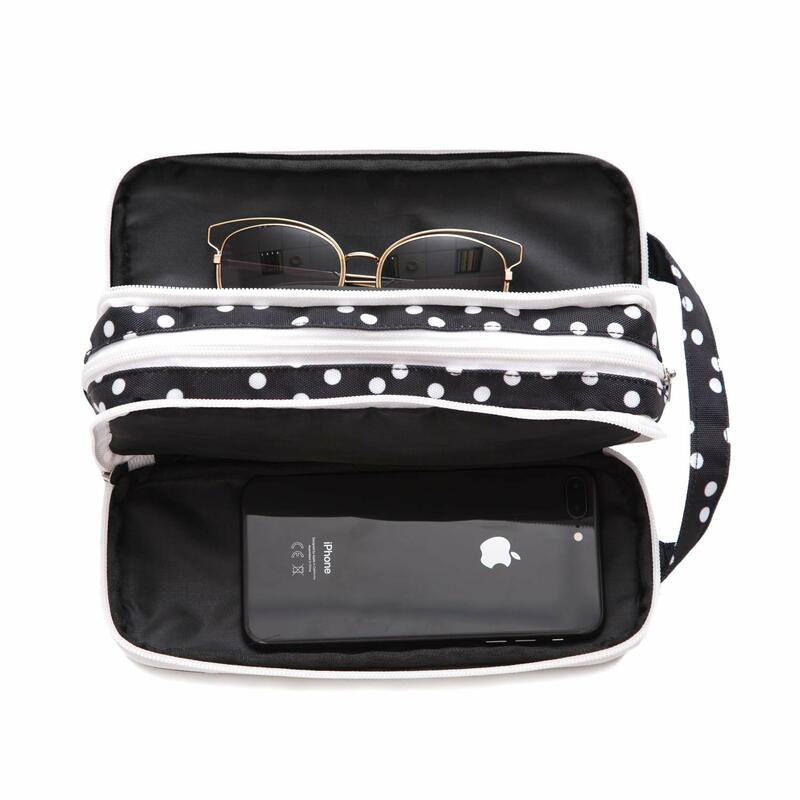 But if you are going for a long trip - the LARGE hanging toiletry bag will be the best choice. It easily fit a majority of full-size toiletry bottles and much more! INCREDIBLE ROOMINESS AND GREAT DESIGN! 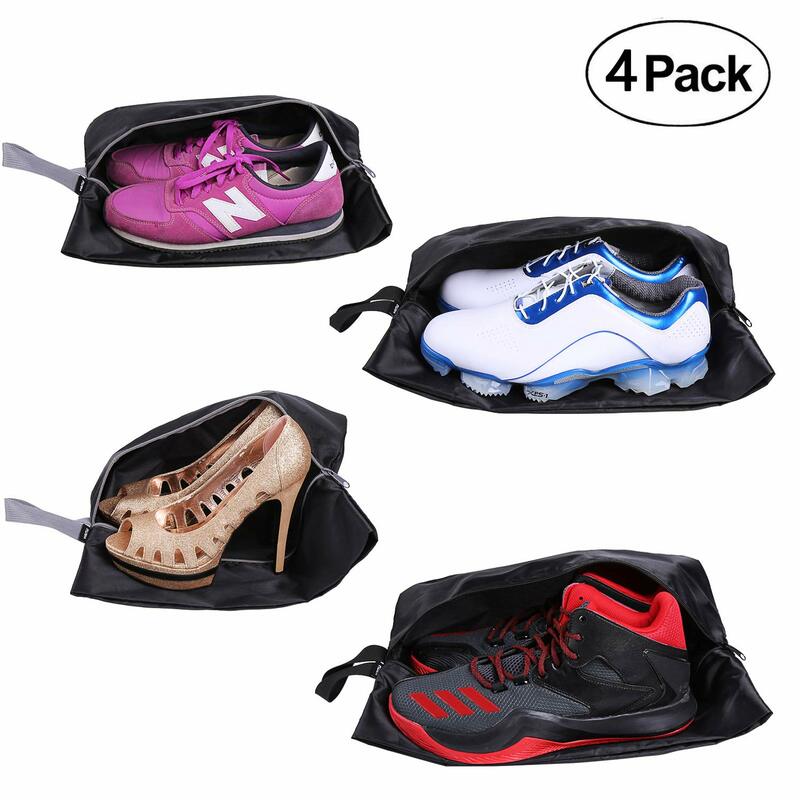 Three large clear pockets of the LARGE travel toiletry bag allow you to hold a lot of your toiletries and cosmetics. You always see what you want to grab! MAKE YOUR OWN SET OF THE TRAVEL COSMETIC BAGS BY BAG&CARRY! Cute polka dot style will be always trendy. A solid gray color will suit men as well. LARGE CLEAR COSMETIC BAG and SMALL CLEAR COSMETIC BAG bag are indispensable in many situations. SMALL CLEAR COSMETIC BAG includes a set of four TSA approved silicone bottles! 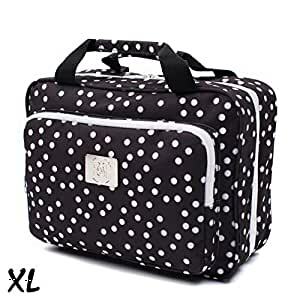 I ordered this because I needed a larger toiletries bag for a long cruise I am going on this winter. 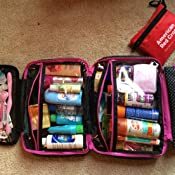 I like to be prepared, which means I pack a lot of travel-size stuff, from medicine to stain sticks to deodorant wipes (great for long hikes). I was worried this bad would be too small and/or not close sufficiently when overfilled with stuff. It's both large and closes! I finally got my chance to take this cutie for a spin on a weekend getaway. Upon arrival to my hotel, I just unzipped the bag to expand it and hung it from the hook on the hotel bathroom door. I really like how the inner compartments are transparent so I could see and use my toiletries directly from the bag. I didn’t feel the need to unpack since all my toiletries were easy to see and access while hanging on the back of the bathroom door. They stayed organized and it was nice to have the counter of the sink remain clutter free. I fit all my toiletries in this bag except for my large round hair brush. Which I usually pack separately due to its extra-large size. I fit everything else with room to spare. My favorite feature is the detachable bag, which I used for my makeup. 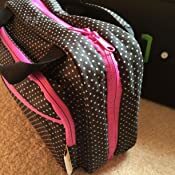 Yes, it is large enough to hold my makeup and removable so I can bring the bag with me to the mirror to apply my makeup. 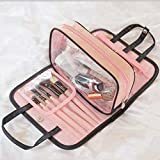 When I travel, I usually pack the makeup bag loosely in my suitcase, but with this organizer, I can now keep it nice and neat all in one convenient place. • FUNCTIONALITY! See video for a demonstration. Detachable bag is easy to attach. Though, I do recommend you pay close attention the first time you take the bag off so you can remember how the zipper works for re-attaching. With a little practice, re-connecting the zipper is easy. 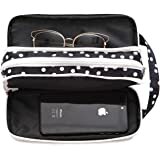 • LOTS OF COMPARTMENTS: 2 zipper pockets on the front, 3 see-though zipper pouches on the inside, 1 polka-dot pouch that detaches, and a hook for hanging. • EXPANSION: The bag unfolds expanding its length to a 28.5“ long travel toiletry bag for hanging on a door/ wall hook or shower rod. • FITS ALL MY TOILETRIES: Holds my full-sized shampoo and conditioner. You would not fit large bottles in the bag, but I fit two 12oz bottles and had no trouble zipping the pouch closed. • EASY CLEAN-UP: Bag easily wipes clean. 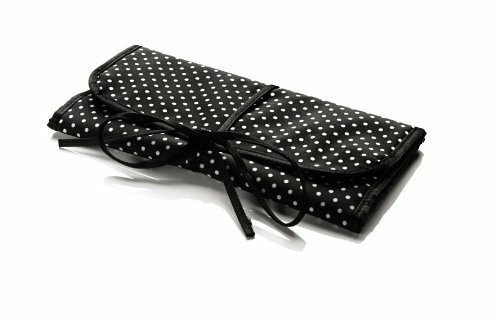 Though, it looks like cotton fabric with those cute polka-dots, this organizer is made of a nice comfortable vinyl material that makes cleanup a breeze. • HIGH QUALITY: Truly professional workmanship. The zippers are strong and sewn with great quality. The entire organizer is stitched tight together with facing so there are no raw edges. This Organizer Gets a Kelly Thumbs Up! 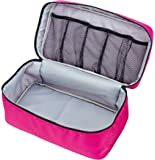 5.0 out of 5 starsPerfect cosmetic case for travel! This is a nice bag! This is almost a dupe of the Monaco Travel Kit from Tumi that retails for $155.00. I have both bags, so I'll do a comparison of them. 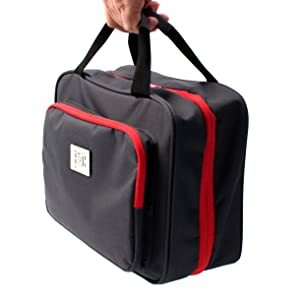 This bag is made of a nice sturdy canvas with three clear interior compartments, one zip off canvas compartment, an attached hanger for convenience, and a nice sized exterior pocket for additional storage. It is a bit larger than the Tumi model, which is made of a nice nylon exterior with leather trim. The Tumi has a flat exterior pocket instead of the more roomy one on the model offered here. The zipper on the Tumi bag glides more easily, but the zipper on this model seems more than adequate. This one has a pretty strong chemical odor to it compared to the Tumi which is odor free, but I believe the odor will dissipate with time. I use the Tumi bag for travel/hotels because the nylon is simple to wipe down with an antibacterial solution after travels. 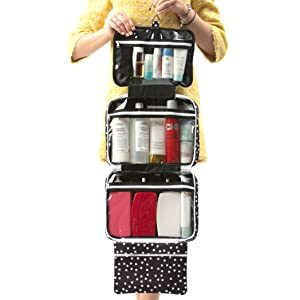 I use this canvas model at our vacation cabin because our master bath vanity area is on the smaller side and I like being able to hang my cosmetics in this from a hook on the over-the-door rack. It isn't exposed to hotel room germs or soiling of any kind, so I don't have to worry about cleaning it. Neither bag can be hung directly from the door because the hanger attachment isn't large enough. They need to be hung from a towel bar or hook of some type. 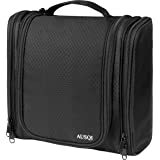 I feel like this bag is a great deal for the money and highly recommend it. If I see any issues over time I'll update my review. Fits so much. Excellent product. Folds up into a compact size. Very cute too. Best part is you can see everything because all the compartments are clear. The only non clear pouch is the makeup pouch but I remove that and put it on the counter to apply makeup. Highly recommend! I know the price point isn't what you'd call high-end, but after looking at a lot of other similar bags and clicking on this one, it seemed to me a bit of an over-spend, for a toiletry bag. 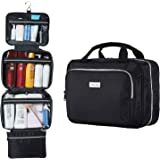 However, I travel a lot and wanted a bag that would be sturdy and big enough to pack everything I like to take, which off and on include a large amount of makeup and hair products, some full-size, without taking up a huge amount of space. This seemed the nice, can't-go-wrong option, and even looked pretty swanky in the picture with the model, so I ordered. When it came today I was slightly disappointed with the material and look, which now I realize is pretty similar to the picture but in person it ends up looking more like a child's lunch box - I guess the material looks nice and sturdy but definitely not what I envisioned as 'premium'. It's also smaller than I expected- you could fit some full size bottles in here but definitely not more than one or two and have room for your other things. Maybe my hopes were unrealistic, and I'll be keeping it, but those few things I would change. I do like all of the compartments which will nicely help me stay organized, and the sturdy metal hanger. 5.0 out of 5 starsI would buy this a Thousand times over.